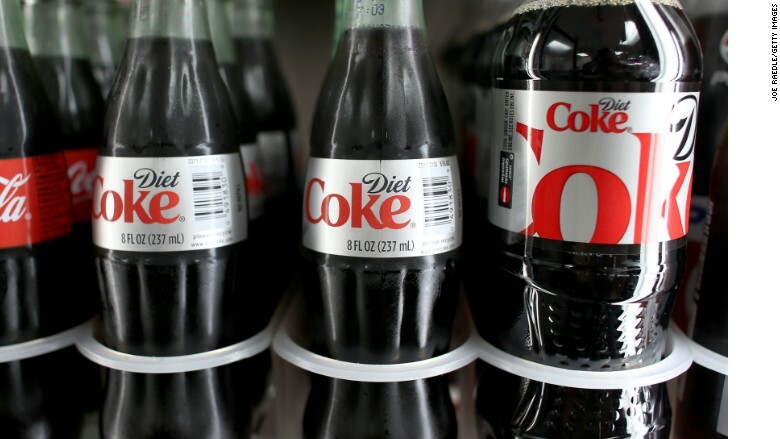 The FTC has said companies like Coca-Cola can keep labeling sodas as diet. Diet soda isn't going anywhere. The Federal Trade Commission has decided not to ban Coca-Cola (KO) and PepsiCo (PEP) from labeling sodas as "diet." U.S. Right to Know, a consumer rights group, had petitioned the FTC to ban the use of the term "diet" because it was "deceptive, false and misleading." "It's regrettable that the FTC won't act to halt the deceptions of the 'diet' soda industry," said Gary Ruskin, co-director of U.S. Right to Know. "Ample scientific evidence links artificial sweeteners to weight gain, not weight loss. I do believe that 'diet' soda will go down in U.S. history as one of the greatest consumer frauds ever." U.S. Right to Know also cited several studies that support its claim that diet drinks can lead to weight gain. The group also argued that falsely advertising food products is against the law. U.S. Right to Know sent letters to both the FTC and the Food and Drug Administration in April with its request. Both groups responded in September -- the FDA said it was still reviewing the request while the FTC said it would not issue the ban.